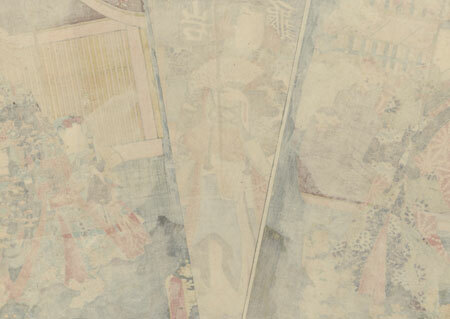 Comments - Lovely scene of Prince Genji visiting the Gankiro Teahouse in the spring. He stands outside the entrance in a courtyard filled with blossoming cherry trees and flowering yellow mountain roses. He grins happily as he looks back at the beauty at left, fanning himself. 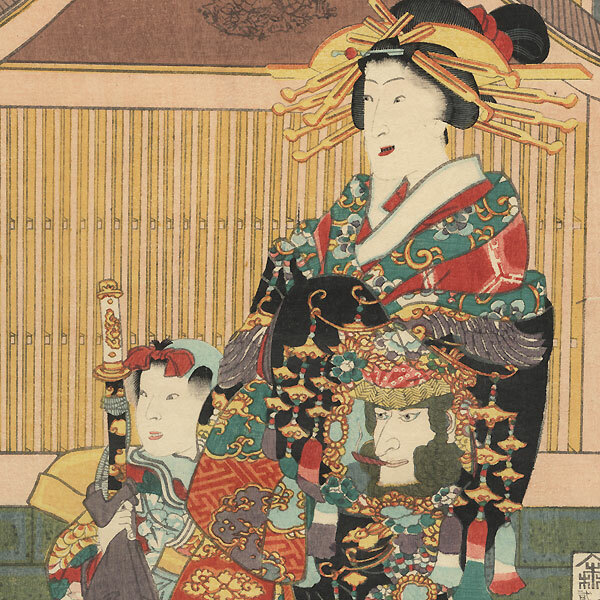 The courtesan at right wears a striking black kimono decorated with a lantern decorated with the face of a foreign man smoking a cigar and trimmed with beaded tassels. A wonderful design filled with lush flowers and handsome detail. Includes burnishing on the black areas of the kimono. The first time we've come across the handsome triptych. Condition - This print with excellent color and detail as shown. Three separate panels, backed with paper. Small tear at edge, repaired. A few small marks. Please see photos for details. Good overall.